Hospitals in the US are taking reality TV one step further by showing live and unedited operations as webcasts on the internet. McLeod Hospital in Florence, South Carolina, is one of a growing number of healthcare facilities in the US that is hosting live webcasts of actual procedures. It means hospitals can showcase their best surgeons and demonstrate the latest techniques to a global audience. Call it medical education or a glorified infomercial, the effort involved is enormous. A television crew has been visiting McLeod for months, filming interviews and inserts for the webcast. McLeod Hospital hopes thousands of people, especially locals, will log on to watch the final product. It wants to get the word out that a laparoscopic supracervical hysterectomy is best done within its operating rooms. In the US there is a great deal of competition in healthcare, says Dr Michael Rose, the vice president of surgical services at McLeod Hospital. "In order to have your mission, they say, you need to have a margin, and so, like any business, one has to be competitive and draw in the patients so that there are the funds to deliver healthcare." 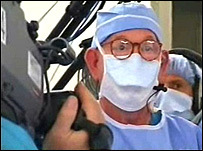 The hospital has hired a specialised company to handle the production. Each webcast or "show", as the video team call it, is about an hour long and costs around $40,000 to make. One of the leaders in this kind of production is OR-Live, which decided to capitalise on a trend that has been going on in households around the world. OR-Live's Peter Gailey says: "What we do is reality in perhaps its purest form. "Our live programmes are unedited, but reality TV is edited. So you have to ask yourself: is reality TV really real? "But I would say that the global embrace of reality TV has perhaps informed what we've done." The purpose of this webcast is to show off the technology available at the hospital. This procedure used to take five hours; McLeod is offering the non-invasive 60-minute version with a healing time of six days instead of six weeks. 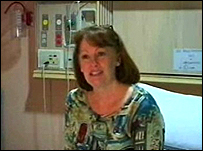 The patient, Terri Cooksey, has been handpicked by the hospital's own doctor. In return for losing some privacy she gets the operation for free, has access to the hospital's top surgeon, is treated like a VIP and even has a personal tour of the place where the procedure will take place. Terri says: "My niece, who's going into the medical profession, is so pumped about this, to be able to see this video. She can't wait. "This is good for a lot of things: training, for me, and maybe down the road we'll all pop popcorn and sit down and watch this movie." During the day there are rehearsals to ensure everything goes to plan, but unlike any other operation there are several non-medical staff in the operating room (OR), including marketing executives from equipment manufacturers, who are hanging corporate logos on the walls of the operating room. In some cultures this would be deemed unthinkable if not objectionable, and at the very least it raises questions about other aspects of the procedure - for example the potential for product placement during the operation. But there is no way that could happen, insists Dr David Chapman, a gynaecologist at McLeod Hospital, who says he does not gain anything from any of the companies directly. "They compete, they sell the hospital equipment, I use the equipment that I need in the patient. I'm not really part of hospital acquisitions and what companies they buy from. "I just request certain instruments that work well for me based solely on the equipment, not on the manufacturer." Nevertheless, in places like the UK, hospitals are generally not put in the position of having to promote themselves with slick advertising campaigns and big budget web casts. This webcast is aimed at multiple audiences. McLeod Hospital hopes that community doctors in South Carolina will watch and refer patients to the hospital. Other viewers might include potential patients themselves. Or-Live's Mr Gailey says: "There's nothing bad about taking ownership of your own healthcare. This tool allows you to do that. It's been very warmly embraced here for that very reason." In another case, patient Yolanda Mozejko is watching the webcast at Columbia Hospital in Manhattan with her doctor, looking for some last-minute re-assurance before undergoing the operation herself. She says: "It's amazing because I can see right into the procedure. It helps alleviate the anxiety associated with having surgery of this nature." While he finds them useful to watch, New York surgeon Dr Charles Ascher-Walsh is more wary about doing a webcast himself, especially in a healthcare system infested with frivolous lawsuits. The video could become a double-edged sword in the event something goes wrong, he believes. "It's certainly a concern, so I think it's somewhat brave of them to do it. On the other hand complications are rare and patients need to understand that complications occur." 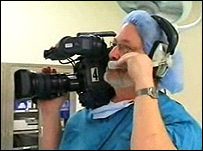 Hospitals point out they have been allowing TV cameras into their ORs for decades, for training purposes, so many surgeons are used to it. Also, the types of operations produced by OR-live tend to have reliable, predictable outcomes with few overly gory moments. After all, the goal is to attract potential patients, not put them off. Click Online is broadcast on BBC News 24: Saturday at 2030, Sunday at 0430 and 1630, and on Monday at 0030. It can be watched on the website from late Friday afternoon. A short version is also shown on BBC Two and BBC News 24 as part of BBC Breakfast: Saturday at 0645. Also BBC World.